It only took an hour for a group of students to tell district leaders exactly what they think is working and not working in their public schools. 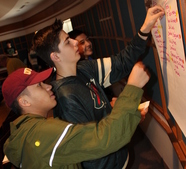 From elective courses and daily schedules, to parking permits and school lunches, about twenty five students gave an honest critique of their experiences in the district as part of a Think Tank discussion. Read more. Students across the district will participate in state assessments throughout the month of April. Visit our website to learn more about the Minnesota Comprehensive Assessments, as well as to view a calendar of when the exams will be given to students at your child's school. Six artists from Stillwater Area Public Schools are being recognized at the Minnesota capitol. Their artwork is on display at the Senate Office Building as part of State Senator Karin Housley's "Art at the Capitol" program, which is designed to support student work in the visual arts. More photos on our Facebook page. The Marine Girls Running Club (MGRC) is off and running again. The all-girls group which is made up of 3rd-6th grade students, is now in its fifth year. The runners train twice a week for a culminating 5k race which will be held on May 27. Several alumni students are assisting the program as junior coaches. The message of the club is that running is a powerful tool for every girl, even if she isn't, or doesn't think she is, an athlete. Stillwater students had a successful showing at the SkillsUSA Minnesota State Championships and Leadership Conference. They took home 12 gold medals in four categories. SkillsUSA is a partnership of students, teachers and industry working together to ensure America has a skilled workforce. Read more. Senior Dylan Cook earned a national medal in the 2017 Scholastic Art & Writing Awards. This year students submitted more than 330,000 works of art and writing, and less than one percent were recognized at the national level. Jordan Wallace earned the Gold Key in the 2017 Minnesota Scholastic Arts and Writing Awards - considered the most prestigious high school arts and literary arts competition in the country. Pony Express Editor-in-Chief, Tiana Meador earned Honorable Mention in the Minnesota State Journalist of the Year contest. This is the 9th time during the past 11 years that a Pony Express student has placed or won Minnesota State Journalist of the Year. Six students were awarded the 2017 Washington County Public Health Achievement Award. They were recognized for their work organizing and running the annual Empty Bowls fundraising event which supports youth and hunger programs in the Stillwater area.